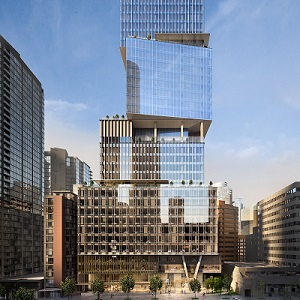 Oxford Properties Group and Canada Pension Plan Investment Board (CPPIB) will build Vancouver’s tallest office building, the 530-foot The Stack, in the downtown core. The co-developers have also announced the building has already secured three anchor tenants. The Stack is a 50-50 partnership between Oxford and CPPIB. The 36-storey tower will offer 540,000 square feet of space at 1133 Melville St.
Oxford acquired the site from Amacon for $26 million in 2010. The previous building on the property had five levels of below-grade parking, four levels of above-grade parking and three storeys of office space. CPPIB has partnered on all of Oxford’s Vancouver assets, so We said it was “a natural fit” to team up when it began considering the redevelopment in 2015. Toronto-based Oxford is the global real estate arm of OMERS, the defined benefit pension plan for Ontario’s municipal employees. Oxford manages more than $46 billion of real estate assets on behalf of its co-owners and investment partners, with a global portfolio spanning more than 60 million square feet. Toronto-headquartered CPPIB is a professional investment management organization which invests the assets of the Canada Pension Plan not currently needed to pay pension, disability and survivor benefits. It’s one of the 10 largest retirement funds in the world, with assets of $356 billion at the end of its fiscal year on March 31. Demolition has begun on the previous structure and The Stack is slated for completion in the first quarter of 2022. The AAA-office space will add much-needed supply to a tight Vancouver market, where the vacancy rate sat at 4.7 per cent in the second quarter. The Stack was designed in a collaboration between Vancouver-based James K.M. Cheng Architects and Toronto-based Adamson Associates Architects. It features a unique climbing and twisting box design with six outdoor decks, a small park and a rooftop patio. Potential tenants told Oxford they considered differentiated floorplates and decks to maximize views important features in a new office building. The stacked box design at The Stack should address those desires. With pre-leases in place with EY, Blakes and DLA Piper, the top two boxes of The Stack are almost fully leased. The remaining bottom two boxes feature additional ceiling heights and larger floorplates ranging from 15,000 to 22,000 square feet. They’ve been designed to incorporate the needs of a wide range of tenants, including technology, digital media and creative firms. EY — a global leader in assurance, tax, transaction and advisory services — will lease 60,000 square feet across floors 19 to 23 of The Stack. Blakes, one of the world’s leading law firms, will occupy floors 31 to 36 for a total of 80,000 square feet. DLA Piper, another global law firm with locations in more than 40 countries, is leasing 67,000 square feet across floors 24 to 28. The Stack was launched to the brokerage community last week and We said it’s already receiving plenty of interest. We said lease rates will line up with new construction costs, which are escalating, and he expects them to be among the highest in Vancouver. Those amenities will include the ability to open windows in the lowest box to allow for fresh air and create a connection with the outdoors, which is proven to boost employee wellness and productivity. To encourage tenant wellness and cycling to work, The Stack will feature club-quality fitness and cycling facilities including: 350 bicycle stalls located at ground level; changing rooms and showers with towel service; and 460 lockers where users can store office clothes and other sundries along with their bikes. The Stack will have 250 underground vehicle parking stalls as well as a dedicated drop-off zone to facilitate passenger delivery via ride-sharing providers and, in the future, autonomous vehicles. The Stack will also include a 5,000-square-foot restaurant and a juice and coffee bar next to its fitness centre on the main floor. Oxford values sustainability, topping the annual Global Real Estate Sustainability Benchmark (GRESB) ranking in the North American diversified retail and office assets category for the fifth time in six years. GRESB assesses the sustainability of property investment organizations based on third-party review of their management, building certifications, stakeholder engagement and performance indicators, among other factors. The Stack is targeting LEED Platinum status and is one of only two high-rise towers in Canada (along with Oxford’s 60-storey The HUB office development at 30 Bay St. in Toronto) to be part of the Canada Green Building Council’s Zero Carbon Building Pilot Program. Low carbon construction materials will be used in building The Stack. All windows will have triple-pane glazing and there will be enhanced air tightness. On-site renewable energy will be incorporated along with a variety of energy- and water-saving features. The building will almost entirely be powered by electricity. “In B.C., electricity is virtually carbon-free, which helps a lot,” said We. The Stack will be “future-proofed” as part of its corporate partnership with Cisco — which develops, manufactures and sells networking hardware, telecommunications equipment and other technology services and products — and its “Smart and Connected Building” platform. “A smart building gathers good data and operates much better and more efficiently,” said We.